A colleague of mine dropped by my office to share his wonderful dining experience at the Bonefish Grill restaurant. This colleague and I like to banter about our dining experiences; we use to agree that the Bonefish Grill was one of the best dining experiences. I should be clear, I’ve never had a bad dining experience at the Bonefish Grill. It’s just been inconsistent. 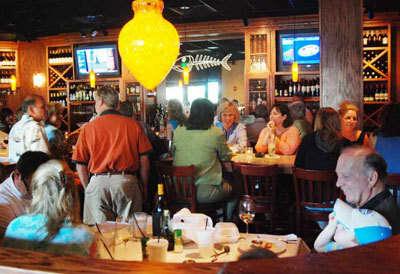 The first time that I went to the Bonefish Grill, I walked into to the restaurant with my wife and I could smell the aroma of fresh seafood. The entry area, where the bar resides, was dimly lit like that of a college bar. It was packed with people like a college bar too, albeit not in a manner liked you’d expect; it was comfortable. Conversation was everywhere, not too loud, not too quiet. Perfect. The night was ripe for an excellent date. My wife and I were lucky enough to score some seats at the bar while we waited for a table. The bar tender promptly took our order for drinks. Two small TVs were in the bar area. Just enough to check the score of the game, but not enough to distract a table from intimate conversation. The bar tender brought over a shrimp appetizer, Bang Bang Shrip, courtesy of the house. “We call this: making friends” he said. Very rarely does a restaurant give away food to patrons without reason. They set themselves up well. Even better, the shrimp was delicious. Finally our pager buzzed and we were able to get a seat. The attentive server took our order as if we were her only concern, almost like a private butler. It was amazing. We topped the night off with a dessert. I walked out of the Bonefish Grill feeling that I had one of the best dining experiences ever. At least, the best in Nebraska. The restaurant had just become my favorite restaurant. I was now their evangelist. Almost like a Jesus spreading the gospel, but not about eternal life, but the gospel of the freshest and most delicious seafood the Midwest would ever see. The second and third time that I went there. The experience was just average. It wasn’t bad, just average. Slow staff. Messed up sides, etc. I expect this sort of stuff to happen at Applebee’s, not my beloved Bonefish. The restaurant became just another restaurant to me. As I was writing this, I’m reminded of when I use to work as a cook at the local restaurant Lazlos 12 years ago. When I was packing up an order, I put an extra serving of french fries for a to-go order. The owner Jay Jarvis saw this. “What are you doing?” he said. “I wanted to put a smile on their face.” I enthusiastically replied. He then told me that I had put too much fries in the order; I was just thinking that he was being a cheap owner. He then went on to say that the next cook might not put in as much for that same customer. The customer will feel let down. What matters is “consistency”, he said. That was my first real lesson in consistency and customer expectations. So many restaurants struggle with this. Maybe they don’t train their staff enough to think about providing a consistent experience? I didn’t write this article to complain about restaurant inconsistencies, but rather to get you to think about the experience you’re delivering to your customers. How can you be more consistent? What tools and processes can you implement to improve this? Think about this. Be consistent.